Eat It or Beat It is a series where we will share our food experiments- new recipes we try out in a quest to expand out of the everyday hum drum and make eating and cooking a fun experience. We will share new recipes, our inspiration, and give an honest review. Bon Appétit! Sean forwarded me the newsletter and pointed out the recipe, mostly because it included some of my favorites- feta cheese, cucumber, and balsamic vinaigrette. We didn’t have any dinner plans, so I decided to try it out that night. Excuse our ghetto kitchen. I will be moving soon! 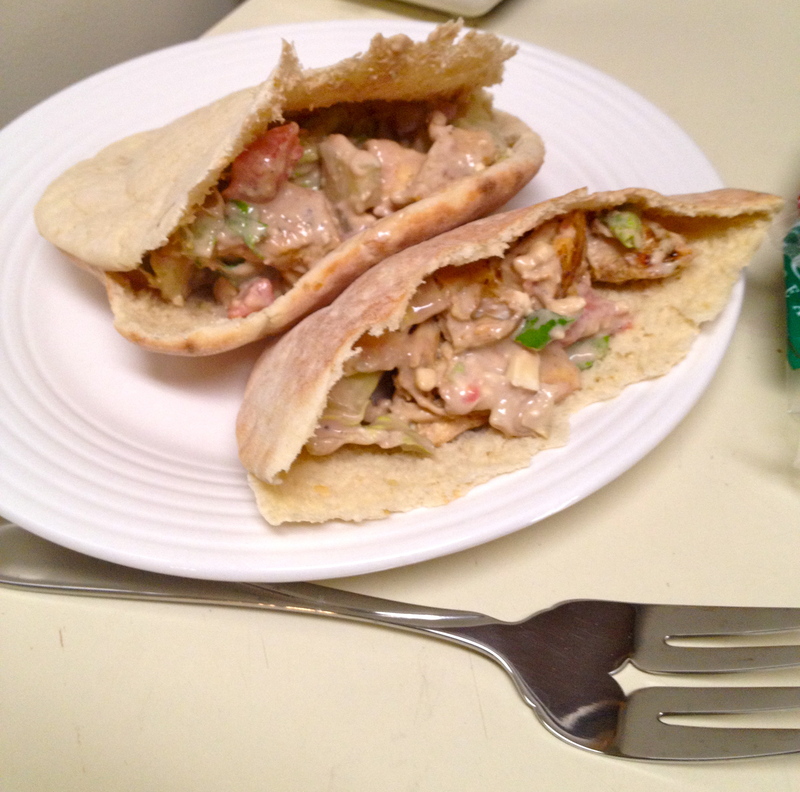 The recipe is simple with not a lot of ingredients and seems like a nice side dish, but to make it a meal, we decided to add grilled chicken and stuff it all into pitas. Let’s call it Gyro-inspired. 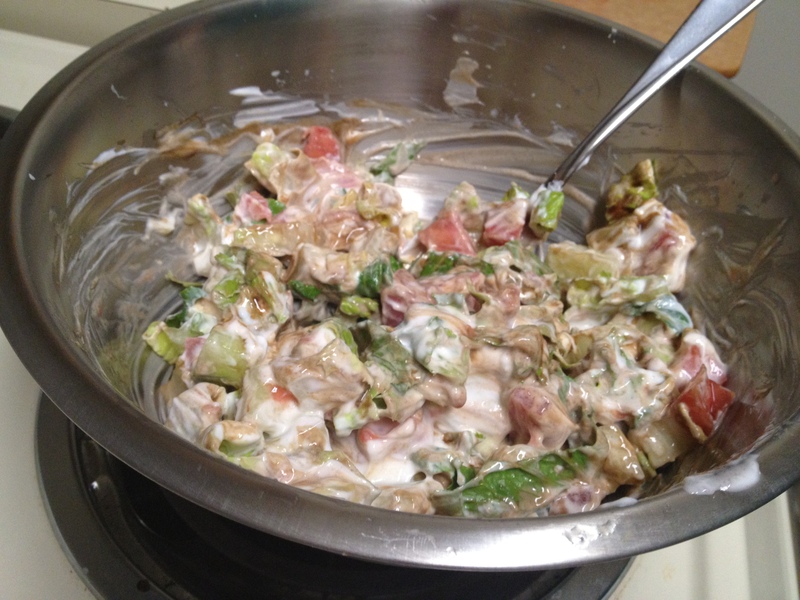 I coarsely chopped the tomato and cucumber (I wanted bigger bites than we usually put on our salads) and also added some roughly chiffonaded romaine lettuce- mostly since we had it and didn’t want it to go bad. I stirred the veggies in a big bowl with a cup of plain Greek yogurt, a few pinches of sugar, and a healthy portion of balsamic vinegar. 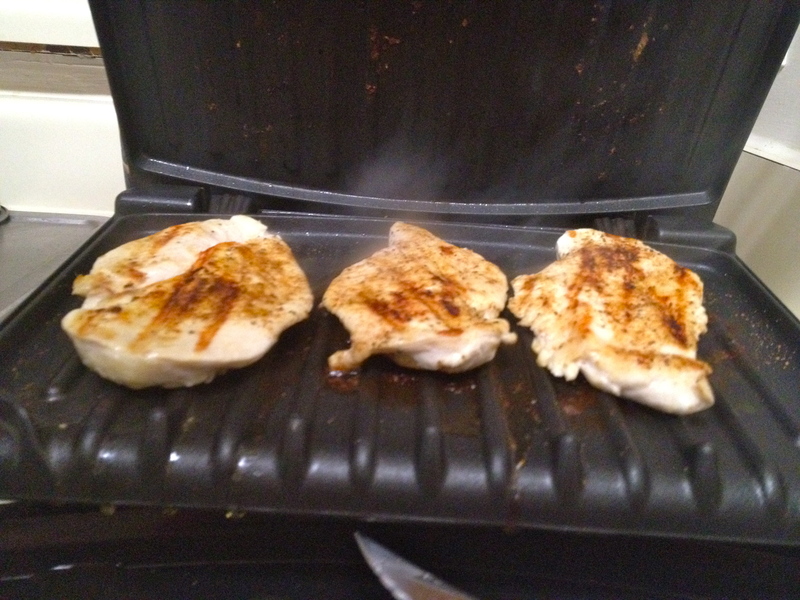 Sean grilled the chicken on his George Foreman lean, mean, fat grilling machine with a little Old Bay, his favorite. 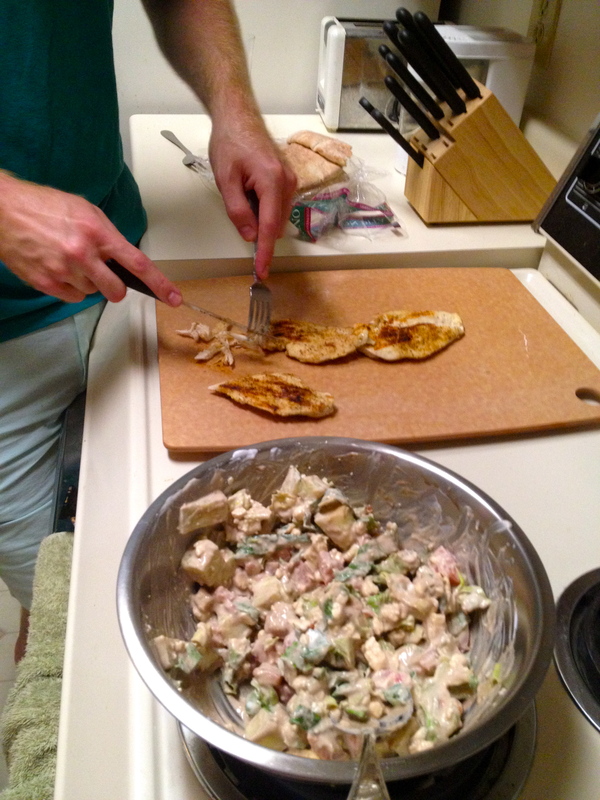 He chopped the chicken and we added it to the mixture along with the whole container of Feta cheese- we used Garlic Herb this time, just for a little spice. 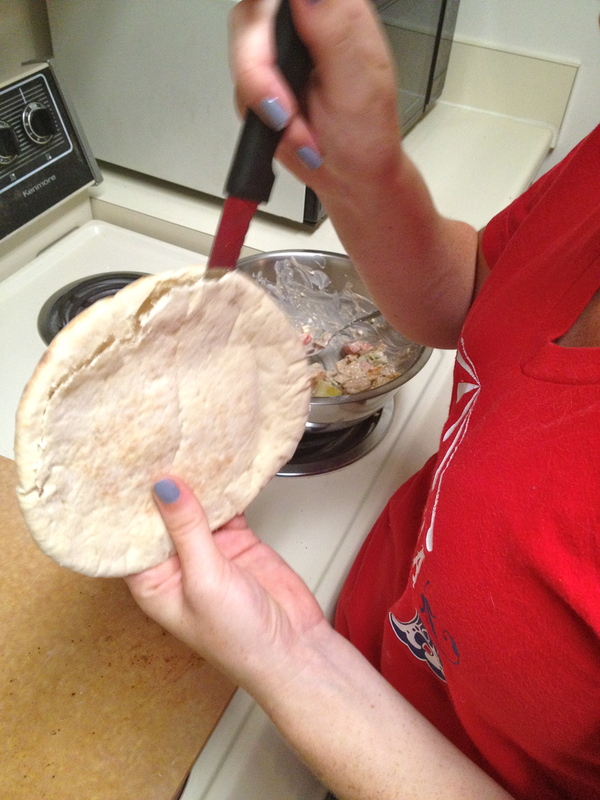 We experimented with different ways of cutting the pita (we used onion pitas for fun, but were disappointed in their lack of onion-y-ness.) First we just cut them in half and stuffed each side. This held up well but was only 3-4 bites. 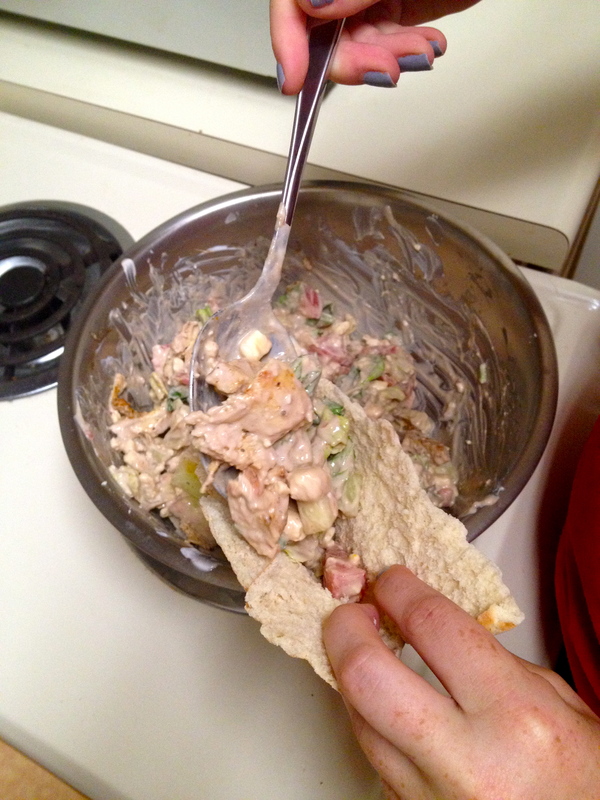 Then we dried fancily slitting the pita and filling the whole thing- major fail. This led to many a pita-splosion while trying to eat them. How do you slice your pita bread? Once they were ready, we dove right in. And to be honest- they were ok. There was a good amount of crunch from the cucumber and romaine. The cheese was creamy and flavorful, and the chicken was warm and cooked well. I guess my biggest complaints would be the sauce and the bread. The sauce was basically balsamic cream sauce. I like balsamic vinegar- but it could have used some contrasting flavors and maybe a bit of spice. Also, as I said before, the pita was pretty boring. Maybe a better sauce would have jazzed them up- I was just really hoping for a garlic and onion flavor and we didn’t get that at all. Over all I would call this an Eat It! 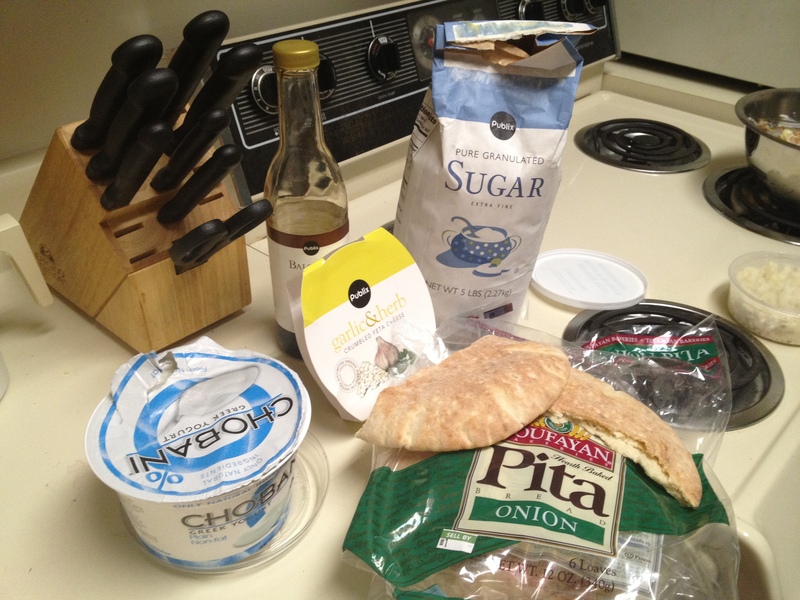 Greek Salad Pitas and a yummy and very easy recipe that’s great for a quick dinner and easy to make leftovers for tomorrow’s lunch. Next time we might try it over a bed of romaine or maybe plated on top of a flat pita. Have you experimented in the kitchen lately? We’d love to hear about it! 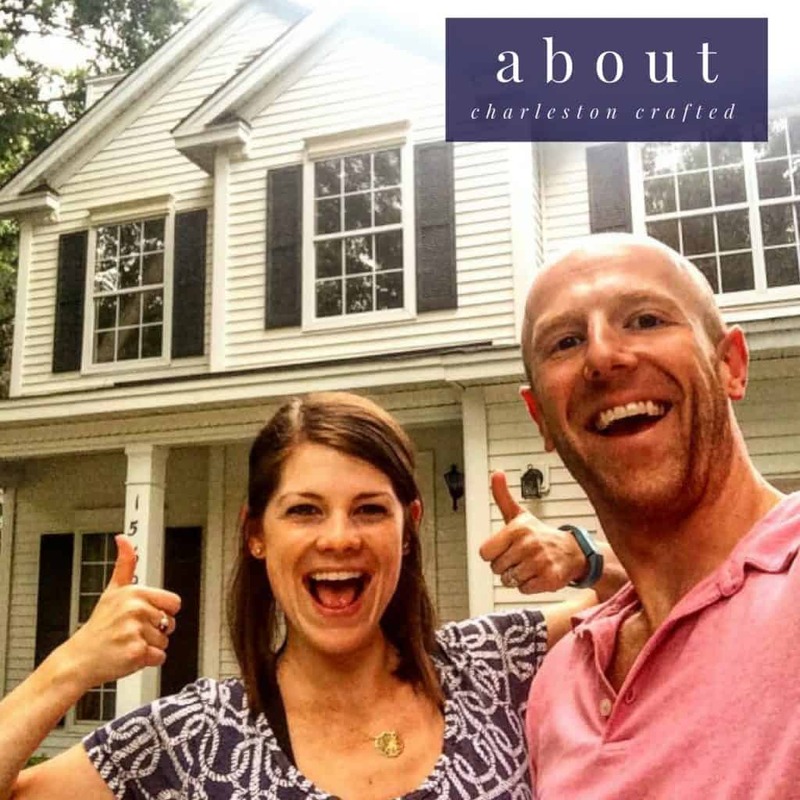 « Welcome to Charleston Crafted!